Televue 6mm Ethos Eyepiece - 1.25"/2"
The Televue 6mm Ethos eyepiece provides a 100° apparent field for a true "spacewalk" view of the night sky. Distortion correction, high contrast and on-axis sharpness for planetary viewing. Televue 6mm Ethos eyepiece provides a generous 15mm of eye relief for comfortable observing. Accepts DIOPTRX eyesight astigmatism correctors. The Televue 6mm Ethos eyepiece will fit either 2" or 1.25" barrel sizes and weighs 0.97 lbs (15.5 oz.). The Tele Vue Ethos eyepieces have pushed the boundries of optical excellence and maximum field of view, creating an unrivaled eyepiece experience. The Tele Vue 6mm Ethos is the latest in the Ethos family of eyepieces, providing an even higher magnification than the original 8mm. An important benefit of the combination of large apparent field of view and shorter focal length is that for a given field in the sky, higher magnification results in a darker sky background. Fainter stars become visible and more detail is seen on all deep sky objects. The Tele Vue Ethos eyepiece provides another big magnification/contrast jump, yielding dramatic views simply not previously possible in any telescope. With the smaller exit pupil, eyesight limitations are also reduced. The Televue 6mm Ethos delivers: 100° apparent field (50% larger in area than 82° Naglers), comfortable eye-relief, accepts DIOPTRX eyesight astigmatism correctors, distortion correction, high contrast and on-axis sharpness for planetary viewing. 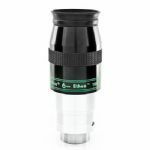 It is the “do-it-all” eyepiece perfect for all scopes that can utilize this focal length. Celebrate the start of the International Year of Astronomy 2009, the 400th anniversary of Galileo's first use of an astronomical telescope, by showing friends and neighbors the best of our wonderful universe. The Tele Vue philosophy (Ethos, if you will) has always been about inspiring “spacewalk” vistas by creating the finest “rich field” refractors and wide angle eyepieces. We hope the introduction of these new Ethos models will further rekindle the appreciation of astronomy and support all the worthy goals of IYA 2009. It’s been quite a challenge to develop new Ethos eyepieces to the same performance standards achieved by the 13mm and 8mm models, perhaps the most honored in history. We hope the increased field of the 17mm and increased power of the 6mm will open up new visual experiences that Galileo could hardly have imagined, from small refractors to the largest Dobsonians. (100°/70°)3 = 2.92 "M.F." or (70°/50°)3 = 2.74 "M.F." or (100°/50°)3 = 8 "M.F." After showing Ethos at a number of events since April 2007, we can safely conclude it brings the observing experience to a new level. This is based solely on user's reactions to views of familiar objects, not on any prejudgments, publicity or hype on our part. While we were quite confident of success, we wanted, and still want, to explore all the ramifications of what a sharp 100° field really represents. Right after NEAF in April, Rodger Gordon, the acknowledged "eyepiece junkie" of all time, wrote me "Definitely the finest wide-angle eyepiece I've ever seen. If God is an astronomer, this is the wide-angle eyepiece he'd choose. You can quote me." Thanks, Rodger. I waited until now to avoid "priming the pump", so to speak before quoting your unbridled enthusiasm publicly. For deep sky viewing of star fields, open and globular clusters, nebulae and galaxies, choose the highest power that frames the subject, so long as the sky background does not reach black, and the atmosphere does not degrade the resolution. The smaller exit pupils permit a darker sky background which achieves greater contrast against the fixed brightness of stars, while the greater magnification reveals more structural details on extended objects. Using eyepieces with larger apparent fields maximizes the viewing experience. The result is an increase in what I would call the Majesty Factor, the nexus of contrast, power and field. It's clear that the largest possible apparent field for a given true field yields the most magnification for greater resolution, with a darker sky background for more contrast as a result of the smaller exit pupil. I believe this combination of contrast, power and field causes the typical "wow" reaction — the Majesty Factor. I think Tom Trusock said it most succinctly in his Starfest (Canada) report: "The same true field at higher magnification means that you'll see blacker skies and more detail." Dennis di Cicco in his 5-star review of Ethos in his October 2007 Sky & Telescope review noted something similar: "Observing with the 12-inch scope, I typically bounce between a wide-field eyepiece for star-hopping and a high-power one for detailed views. But the Ethos gave me both. The field was large enough to star-hop, and the magnification was high enough to bring out faint stars and resolve details in galaxies and star clusters." (He coincidently also illustrated field sizes using the Double Cluster.) Let's try to quantify the so-called Majesty Factor. While we cannot quantify the majesty of a great symphony, work of art or edifice, I think a meaningful Majesty Factor is quantifiable for those great deep sky views. Let's consider a range of possible eyepieces with apparent fields of 50°, 60°, 68°, 82° and 100°. Now let's pick an object, (like the Double Cluster) and let's say it's properly framed in the field of a 50° Plössl with a 26-mm focal length in an f/4 telescope so the exit pupil = 6.5-mm. Let's arbitrarily assign a factor of 1 to the power (magnification) of this telescope and a factor of 1 to represent the contrast for the 6.5-mm exit pupil. Therefore, for the given true field, the Majesty Factor = 1 (power factor) x 1 (contrast factor) = 1.